I haven’t blogged about lot of things — starting with Hackfest Day 2 onwards, the end of the semester, the dyonic Reissner-Nordstroem blackhole and associated realisations, FOSS.IN/2009 and KDE PoTD, and whatever I’ve been doing all through December. But let me selectively blog about the observing sprint of December 2009 right now, because I’m in an excited state after finishing that. The rest after I finish this. So I had planned from the very start that I should make full use of my new-got 17.5″ telescope (which I got in March 2009, after nearly 18 months of waiting after placing the order). Little did I know, back then, that I’d have little time to use the telescope when it arrives — so I planned to make use of it this December by going away observing to a dark site for a lot of nights. I thought I could get away doing this during the Christmas week, but it turned out that it was full moon — so I had to change my plans so that I could stay back here during the new moon and go observing to “vasUlify” (Hindi + English, roughly meaning ‘get the returns / profits out of’) the telescope. Without much ado, let me go on to summarize the observing sessions and the objects observed, supplemented with sketches. Location: On the terrace of some complex, Siddharabetta village, near Koratagere, Tumkur Dist. People: Naveen Nanjundappa and me. Weather: Skies were exceptionally good and BLACK, but there was a lot of humidity and haze that diffused every star into a halo. After local lights turned on at about 1:30 AM, the skies were washed out by scattering of local lights by low-level humidity. Fog set in by 3 AM and we slept. Bortle Class: a little better than 3, I suppose — before local lights came on. Highlights: Horsehead Nebula, Orion Nebula, M 74, some random nebulae, Rosette Nebula — the first times. Location: doDDamallayyanpALyA, near Koratagere, Tumkur Dist. People: Amar Sharma and me. Weather: Skies were okay for most till 1 AM. It fogged by about 1 AM and cleared by about 3 AM, but we were fast asleep. We got up by 4 AM, and it was worth getting up. Highlights: Roughly for every galaxy we pointed the telescope to, we found one or two other galaxies in the field! M 51 was pretty good. Sombrero galaxy too. Helix Nebula, NGC 55 etc. Weather: Skies were cloudy when we were on the way, and cleared for a while when we reached Koratagere. But by the time we set up the telescope, it fogged up and never cleared. The session was a failure. Bortle Class: a little better than 4, when it cleared. Location: Keemale Estate, near Karada Village, Coorg Dist. Weather: Clear in patches at 6:30 PM, overcast by 7 PM, cleared again by 10 PM, clear till 3 AM. Overcast after that. Bortle Class: Better than 4. People: About 13 people — we had a starparty organized by BAS at the location. Weather: Clear in patches at 6:30 PM, overcast by 7 PM, cleared again by 9 PM or so, clear till 3:30 AM or so. Overcast after that. Bortle Class: Slightly better than 4. Highlights: Horsehead Nebula seen through the 8″, Orion Nebula, Double Cluster, M 81, Leo Triplet, Splitting Alnitak, lots of other bright stuff. People: Keerthi Kiran, Amar Sharma, Pavan Keshavamurthy and me. Weather: Clear till 4 AM, when it clouded up for a while and cleared again by 4:15 AM. Clear till 5:15 AM or so. Highlights: Eridanus Galaxies, Sculptor Galaxy, NGC 891, M 51!! !, M 31, Extragalactic Globulars in M 31 and Fornax Dwarf, lots more. M 77: Showed clear nucleus and surrounding haze. NGC 1055: Sported a dark lane and central bulge. NGC 1087, NGC 1042, NGC 1052, NGC 938 and nearby galaxies were visible. Didn’t bother seeing features. 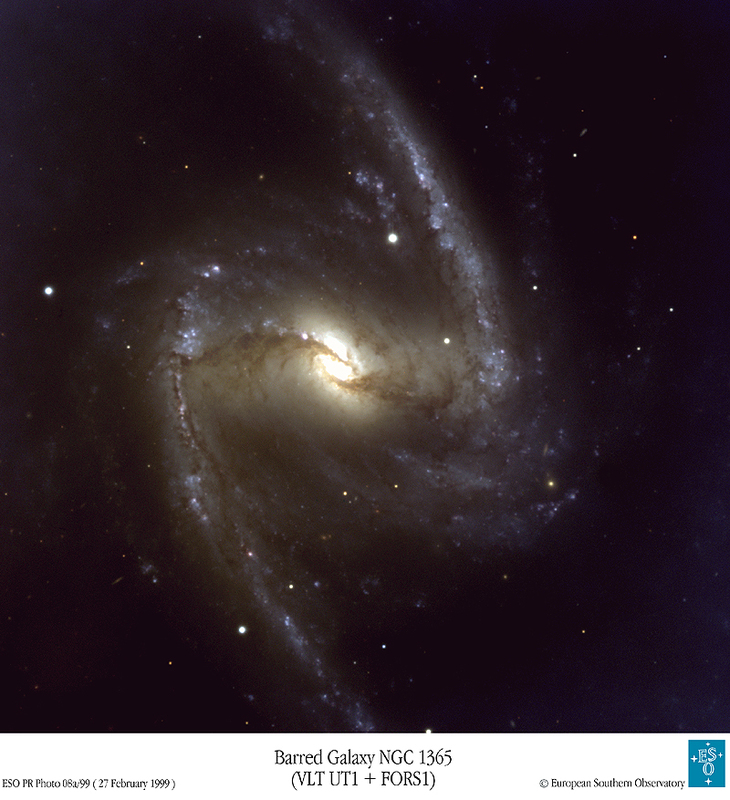 NGC 1232: During session 4, showed two spiral arms, not very distinctly, though. During session 6, it showed the feeling of a lot of spiral arms, but could not see anything concrete. NGC 247: This object was very low in the horizon when I saw it during session 4 and the trees were probably blocking part of my scope’s aperture. However, I could still notice that the nucleus was somewhat eccentric in the brightness — which is a feeling because of the dark lanes on one side of the nucleus as seen in a photograph. Bode’s Galaxy, M 81: Showed hints of spiral structure, which Pavan confirms is correct. Best view during session 5. Cigar Galaxy, M 82: Beautiful as usual — didn’t step to higher magnification as I’ve done that earlier. M 65: Couldn’t see details — probably because of lack of time and deteriorated skies. Didn’t switch to higher magnification. M 66: Showed some hints of spiral arms — but nothing distinct. Didn’t switch to higher magnification. M 95: Did show some hints of spiral structure, but could not spend more time on it. M 96: Could not spend time to see details. M 109: Best view during Session 2. Could see hints of spiral strucuture, but no distinct spiral arms. Bar was visible on Session 6 as well. NGC 7739: We stumbled on this accidentally while trying to search for Sculptor Galaxy. It looked like an elliptical-shaped resolved globular cluster. We later found out that this was NGC 7739 and that the “resolved” feeling was indeed because of the mottled structure of the galaxy and the several knots that it has. Sketch of view through the 8″. The contrast has been exaggerated quite a bit. 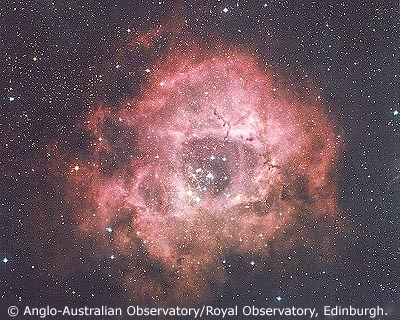 Rosette Nebula: While we thought this was a purely photographic object, we were able to seethe brightest part of it during Sessions 1 and 6. The part we saw appears to the top right in pinkish white in the photograph here. A semicircle of nebulosity around the star cluster was visible without the OIII filter! M 78: Nothing much to say — appeared like a patch, as usual. Skull Nebula (NGC 246): Was able to make out the shape of the nebula to some extent. Didn’t have the patience to put on the OIII filter. Thor’s Helmet (NGC 2359): I saw this object during session 4. It did show some shape, but could not make out the helment distinctly. There was a train of stars with some nebulosity that I could imagine to be one of the feathers of the helmet and there was some nebulosity that resembled the helmet — but I could not confirm this against images. It might be that I’ve seen the train of stars to the 2 o’ clock in this image and seen only the other feather of the helment and the helmet itself correctly. NGC 1788: I saw this nebula during session 1 and session 4. The nebula “originated” from a star and had a bright portion just above it (as seen in the image. Helix Nebula (NGC 7293): Helix nebula appeared faint, but with the OIII filter, it was showing clearly the central hole, the wisps and the mottled surroundings. It was almost like a black-and-white Hubble image. Owl Nebula (M79): With some averted vision, I was able to notice the “eyes” of the owl. Confirmed the orientation and location of the guys with a nearby reference star against a photograph. NGC 604: We were able to easily see this extragalactic nebula in Triangulum Galaxy with the 17.5″ as well as through the 8″. It appeared as a bright spot next to the foreground star. 37 Asterism: We were able to see this beautiful asterism that looks like a ’37’ written in the sky. The view was better through 17.5″ as it increased the brightness of the stars that formed part of the 37. I saw it through 17.5″ during Session 4, and through 8″ during Session 5. M 35: We saw this open cluster during several sessions (particularly Session 5). The nearby dense NGC globular was very beautiful in the 17.5″. Double Cluster: We saw this pair of open clusters, once again, on several sessions. Everyone enjoyed the view during Session 5. It looked really beautiful through the wide-field 31mm Nagler eyepiece on the 17.5″ telescope! We saw a lot more open clusters, but I will not document them here. M 79: This globular in the constellation Lepus was completely resolved into stars with the 17.5″ telescope at 400x. Seen during session 5. Everybody seemed to enjoy the view. G 76: Amar showed me this tiny, faint globular in Andromeda Galaxy during Session 6 through the 17.5″. M 3: Seen during session 5, everyone seemed to enjoy the view of this globular as it was completely resolved into stars. Alnitak: We were able to split this tight double star in Orion using 200x magnification on the 17.5″. Both stars are similar in colour, but one star is marginally fainter than the other.